If direct updates to domain names cause exceptions to their associated preset profiles, you can use these instructions to view the exceptions. Exceptions are normal and do not indicate a problem. Note: If you don't see the Advanced Options section, you'll need to click on the small arrow at the very left-hand edge of your account. In the Present Profiles section, click Manage. The Preset Profile Manager window displays, which shows your profile exceptions. 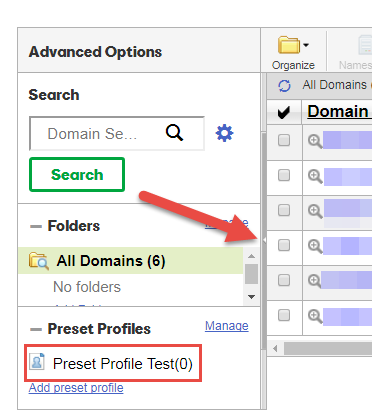 See Manage Preset Profiles for more information.